Welcome to Tracking Trips. Tracking Trips is a valuable tool to add to your handicapping Arsenal at any level. Watching horse races with an emphasis on spotting troubled trips is a learned art that comes with experience. Horses on our list usually fall into one of these categories, “Horses who had troubled trips, Horses who ran with or against a significant and true bias, Horses who received less than ideal rides, or checked, steadied, lost momentum, or were on the worst part of the racetrack. There can be other reasons, and our Trip Notes and Race Rating will explain why a horse is on our list, and how they should be viewed or treated in their next and upcoming starts, as well as how that particular race that landed them on our list should be viewed. Horses are added to our list frequently, so check back often to keep up on everything Tracking Trips offers. We focus on the major circuits but a horse from just about any track may turn up from time to time. Our subscribers have 24/7 access to our list and database which is updated frequently. We suggest adding our horses to your stable mail and paying attention to them when they run back. This is especially important first time they run back after being added to our list. Whatever your level of play and experience, these horses and notes can help your game. Even the most astute and experienced players can use another set of trained eyes spotting for them and the beginner can both capitalize and learn from our service. You will also find comments and analysis on many of the horses when they are running so we encourage you to check in on those days. You will also find notes on a real or false track bias on various days. That alone can be a great edge. The database is available through your PC, tablet, or smart phone. 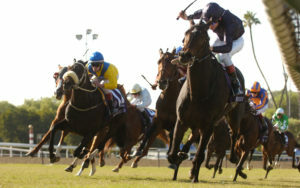 Ideally use the service with your stable mail and as a handicapping tool. Most horses are added by long time handicapper Jonathan Stettin who has proven to have a good eye. To see how far back Jonathan has been watching races and spotting trouble read the article “Did You See That”. We are sure you’ll find the service more than worth the cost. Let’s get an edge and make some money. To get a feel for Jonathan’s mastery of a true track bias read the articles “To B or Not to B” and “Against the Track Bias“. As an added bonus to our subscribers, Tracking Trips now includes “SPOT PLAYS” from Jonathan Stettin, The Pick 6 King. Subscribers are encouraged to check for “Spot Plays” frequently, especially on big days, super cards, big carryovers, and during the exclusive meets. Jonathan Stettin talks about what Tracking Trips is and isn’t and how to get the most out of this handicapping tool. 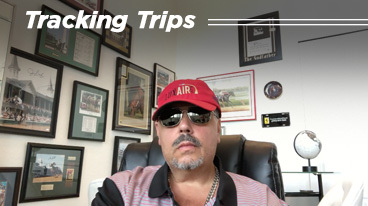 Tracking Trips also offers clubhouse notes from Jonathan Stettin on a regular basis. The insight into his perspective on the happenings on and off the racetrack will bring you closer to the game than before and provide a lifetime of study of The Sport of Kings. You’ll find plays, and horses to play against, and get an outlook you can’t get from a Harvard education. We also offer broadcasts and webinars, some only available to our Tracking Trips #MEMBERSHIP on various big race days and cards, as well as on various other handicapping and racing topics. Jonathan also offers handicapping seminars and instruction. E-mail Jonathan directly with any inquiries at p6k@pastthewire.com. For $12.99 per month you will have access to our Horses to Watch, our Trip Notes, Spot Plays, Track Bias Info and more including Jonathan’s clubhouse notes. NOTE: Discounts are provided for six month and one year subscriptions. For $12.99 per month you will have access to our Horses to Watch, our Trip Notes, Spot Plays, Track Bias Info and more including Jonathan’s clubhouse notes. Multiple month discounts and recurring billing is available.